Originally I was going to title this post "Last Minute Gift Ideas", because if there is anything that 15 years in a retail pet store taught me, it's that for some reason or another, pet parents often leave their furry companions until the very last possible opportunity anyway (not a bad idea, since last year I bought my rescue doggy a fab new bed and hid it in a sliding closed closet, only to find him dragging it around the living room an hour later), so really it's just a fun gift guide. Considering that roughly 60% of you purchase holiday presents for your pets, here are some great ideas. Let's face it, sometimes the best things in life are free. Save your empty paper towel rolls, cereal and kleenex boxes, and create an awesome tube maze for your hamster or gerbil! Of course your snootier hamsters and gerbils could always move on up to a Habitrail kit (aren't these awesome?). For kitties, how about leaving just enough toilet paper hanging from the roll for them to spend two minutes unraveling the whole thing, while you spend ten minutes rolling it back! If you don't feel like cleaning up, just improvise with household items. No matter how many toys I bought one kitten I once had, his favourite pastime was playing a solo pick up hockey tournament with beer bottle caps and tin foil balls. If you have any great homemade toy ideas, share them with us in the comment section, and please remember all, to supervise your pets when they are enjoying any such inventions! Who can go wrong with squeaky toys and noise makers? At the top is a cute stuffed squeaky from PetSmart that costs only $5.00. More importantly, a portion of each sale goes toward animal charity! Personally, I recommend buying one of the three great items from the Luv-A-Pet line, as you'll be helping needy pets with a simple click! One of my favourite gifts that I've given to friends & clients over the years (at least 30!) 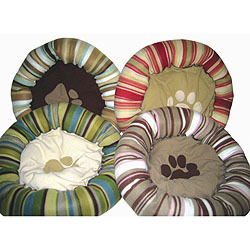 is the Ultra Soft Pet Bed from Kitchen Stuff Plus (I'm trying really hard not to sound like Oprah, but I did kind of scream that in front of my computer). They're very reasonably priced, machine washable, & have proven to be extremely durable in my home. With regard to treats and bones I've found anything by Benny Bully's to be impossible for pups to resist (the original liver chops make an amazing training tool), and smoked dog bones, which are longer lasting and healthier than rawhides, are also a favourite (just don't step on one in the middle of the night!). 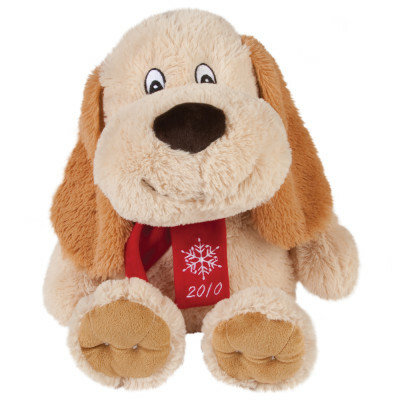 Pet Valu carries a great selection from Benko. For dental care, I recommend both Pedigree Dentabone, and Booda Fresh N Floss rope toys. The above mentioned items should be available at almost all pet food and supply retailers. Three words : "Anything by Kong!" While the smallest of these impossibly durable toys can be found for under $10.00, the majority of the products fall between $10.00 and $30.00. In all my years in retail, I only had one of these things returned to me (out of thousands sold), and I don't think I would have wanted to meet the dog that got through it! Besides the classic Kong rubber dog toy, the company also offers retrieving toys, treats, and treat dispensers for dogs and cats. Here's a tip I've been offering clients for years. 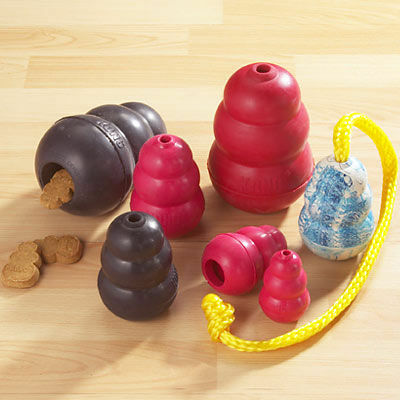 At bedtime, spread a bit of peanut butter inside the Kong (not too much) and freeze the toy overnight. In the morning on your way out, give it to your dog & he'll experience fun (and frustration) for hours. For the kids who are not yet mature enough for a furry friend that walks, why not get them started with an Aquarium Starter Kit? Currently, Big Al's Canada has them starting at $14.99. Your kids will learn responsibility, and you will inevitably learn to lie to your children when you replace one floating fishy with another similar fishy that you searched for high and low for an entire afternoon! Of course, if you are just too darned indecisive, this is the safe route. Lets start with charitable organizations. Remember that unfortunately at this time of year, many choose to "impulse buy" a new family friend, without adequately doing their homework. As a result, shelters find themselves inundated in the new year with animals who want nothing more than to love you and be loved themselves. Take this time to donate to a local, no kill shelter on behalf of an individual or dearly departed pet. Remember, the amount you donate is not important, though the fact that you are helping these wonderful volunteers tend to these pets really shows your appreciation. Gift certificates are another great way to wrap up your shopping, and don't listen to those who call you lazy, they're on the naughty list! Most major pet food chains offer gift certificates in any amount, and below is a list of local Toronto pet suppliers and service providers who do as well. If you are offer local gift certificates, let me know so I can update this list! Feel free to share your favourite pet presents in the comment section!